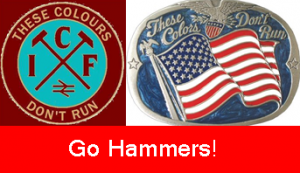 TO the United States, where fans of West Ham United are watching their team take on the might of The Columbus Crew. The Star sees members of the Hammers’ Inter-City Firm unveil a banner and start a bout of fisticuffs with the local Hudson Street Hooligans, “a mob who model themselves on the east Londoners”, by eating goat burgers, talking in an 18th century Dutch patois and holidaying in Soviet Central Asia. The argy-bargy is all too terrible. But things are about to get really nasty. Indeed, dear readers. A sad day when a fan of the team wot won the World Cup employs an Americanism in his speech.